← Bibi: ‘We only tell truth in Israel’!! Last week Israel-Firster Hillary Clinton said her department will designate Haqqani group a ‘terrorist group’. However, on Thursday, Washington faced with very hostile reaction from Islamabad pulled back from its earlier threat and put symbolic sanctions against some individuals (Abdul Aziz Abbasin, Haiji Faizullah Khan Noorzai, Abdur Rehman, Fazal Rahim, etc.) claimed to be linked to Haqqani group. The Obama administration is seeking to smooth things over after the remarks from Admiral Mike Mullen which triggered a war of words with the key ally even as it pushes Pakistan to crack down on Pakhtoon groups helping Taliban fighting US/NATO occupation forces. Washington’s symbolic slap has disappointed Zionist warmongers who want a military confrontation between the US and the only Muslim nuclear power whose public happen to be anti-Israel. Pakistan’s foreign minister, Hina Rabbani Khar, in an interview with Al-Jazeera’s Scott Heidler (Sept. 24, 2011) said the Haqqani group that United States hold responsible for last week’s attack against the American embassy in Kabul was CIA’s “blue-eyed-boy” for many years. The October 2, 2011 editorial in the Arab News said: “President Barack Obama has stepped in to check the damage inflicted by Adm. Mike Mullen’s recent claims accusing Islamabad of being hand in glove with the Haqqani network. The White House has distanced itself from Mullen’s claims, including the one linking ISI to the recent attack on US Embassy in Kabul. Mullen himself now suggests Pakistan holds key to peace in Afghanistan and Southwest Asia. There’s no stable future in the region without a partnership with Pakistan, pointed out the US top gun just before passing on the baton to his successor. The crazy idea of sending US ground forces into North Waziristan in Pakistan to deal with the Haqqani network has been dismissed for now”. Haqqani group leader Sirajuddin Haqqani told British news network that his group is not involved in Kabul bombing or the assassination of former Afghan President Burhanuddin Rabbani. Judging by CIA-Mossad-RAW-KHAD’s anti-Pakistan false flag operations in the past – who will else benefit from US-Pakistan military confrontation other than India and Israel. Some American military officials have already stated that US forces intend to stay after the 2014 withdrawal deadline. So, what is this Haqqani group? It’s a group within Taliban resistance movement lead by Maulvi Jalauddin Haqqani who was a senior Mujahid commander of Hizb-e-Islami under Mujahideen leader Maulvi Mohammad Yunis Khalis. Maulvi Mohammad Yunis Khalis as head of Peshawar-based Afghan Mujahideen Alliance, accompanied by Professors Burhanuddin Rabbani and Sebghatullah Mojadeddi, Pir Sayed Ahmad Gailani, Maulvi Mohammad Nabi Mohammadi, Maulvi Jalauddin Haqqani and other lesser-ranked mujahideen leaders and commanders had visited the White House in 1985 on President Ronald Reagan’s invitation. President Reagan met Afghan Mujahideen leaders at the White House, at which Dubya Bush’s ‘best Afghan’ Dr. Zalmay Khalilzad acted as interpreter. Reagan referred to the Afghan mujahideen as freedom fighters. He remarked that the Afghan mujahideen leaders were equivalent of the great Americans who founded and liberated America. After this meeting, the US assistance to the Afghan mujahideen was increased to enable them to put up a better fight against the Soviet occupying forces in Afghanistan. The only senior Mujahideen leader who refused to accept Reagan’s invitation was Gulbaddin Hekmatyar, who led his own faction of Hezb-e-Islami. Both Burhanuddin Rabbani and Gulbaddin Hekmatyar, President and Prime Minister of post-USSR Afghanistan – took refuge in neighboring Iran after Taliban forces ran over Kabul in 1990s. Former Congressman, Charlie Wilson, who played ‘go-between’ Washington and Mujahideen – had called Jalaluddin Rabbani “goodness personified“. 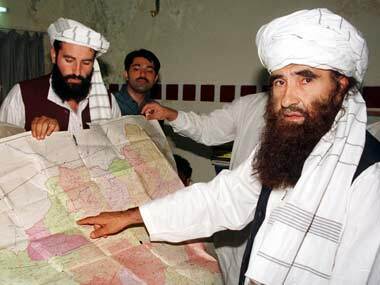 As result of Jalaluddin Haqqani’s prolonged illness (he is in 70s), his son Siraj Haqqani leads the group. Siraj is considered to be more under the influence of Taliban leader Mullah Omer than his father. That’s one of the reasons Pakistan is reluctant to have a direct fight with Haqqani group and sees Jalaluddin as the last card for the US to have a deal with Taliban before his death. Asif Ezdi, former member of Pakistan’s foreign service, wrote in The News (October 3, 2011): “The fact is that the US has no option but to work with Pakistan. It is not winning the war in Afghanistan despite claims to the contrary. It can reduce but not eliminate dependence on Pakistani air space and land routes for supplies to its troops in Afghanistan. The US threats of military action against Pakistan and aid cut-off lack credibility”. Pakistan’s renowned cricketer turned politician, Imran Khan, Chairman Tehrik-e-Insaf Party has criticized Washington for calling Islamabad to attack Haqqani group while itself having talks with Taliban. The USA is withdrawing from Afghanistan – but it needs a reason to withdraw. First the alleged killing of Osama bin Laden within Pakistan – this was needed start the end the War on Terror – A war which had started with a lie. Killing ‘the most wanted man’ in Pakistan was making a case against Pakistan – that it had been keeping him under protective custody. A way to make Pakistan look guilty. With Osama officially dead – Pakistan was still needed to keep the pressure on Afghanistan – so that the US armed forces could withdraw safely. There is an incident in the Korean war, Turkish soldiers were posted on a bridge and were guarding it. US soldiers were being over run by the advancing Korean forces. US soldiers started retreating – crossed the bridge. The Turkish soldiers stood at their post on the bridge where firing back to help the US soldiers cross the bridge safely. When all the US soldiers had were on the other side, instead of waiting to let Turkish soldiers retreat , the bridge was blown up, consequently the Turkish soldiers were killed.